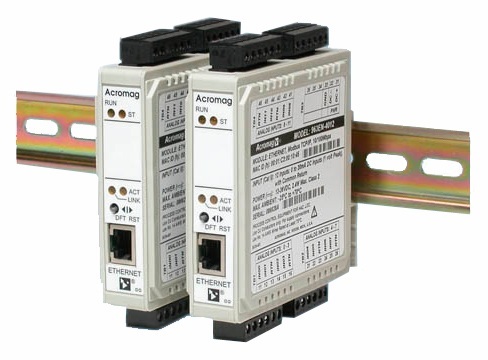 These modules are designed with a compact saving design to provide an isolated Ethernet network interface for twelve analog input with multi-range inputs to accept signals from a variety of sensors and devices. In addition these modules ensures High-resolution, low noise while delivering high accuracy and reliability. • Approvals: CE/ATEX marked; UL, cUL listed, Class 1 Div 2 Groups A, B, C, D; EtherNet/IP, Modbus/TCP conformance tested. • AC Current sensor used with 963EN DC current input models. One sensor per channel is required. – Ranges user-selectable on each terminal block for a group of four input channels (4-channel basis). -0 to 1mA, 0 to 11mA, 0 to 20mA, 4 to 20mA . – 0 to 20 amps AC (with optional AC sensor) . – ±1V, ±5V, or ±10V DC. – EtherNet/IP or Modbus TCP/IP 10/100Mbps . – 15 to 36V DC supply (2 Watts) required. – UL, cUL listed, Class I; Div. 2; Groups A, B, C, D.
– EtherNet/IP, Modbus/TCP conformance tested. – Better than ±0.05% of span for nominal input ranges. – 16-bit Σ-∆converter. 0.005% (1/20000) resolution. – Normal Mode: Better than 40dB @ 60Hz. – Common Mode: Better than 140dB @ 60Hz. – -3dB at 3Hz, typical. – DC Current Input: 49.9 ohms. – DC Voltage Input: Greater than 110.5K ohms. – Operating: -25 to 70°C (-13 to 158°F). – 1500V AC for 60 seconds or 250V AC continuous. – 3-way isolation between I/O, network, and power.